Such a joyous day! I for one am seriously ready for warm weather to arrive. Winter has been so long and so tedious here on the hillside farm. While it’s not exactly balmy here in Pennsylvania, there are signs of spring arriving. The days are longer now and I’ve been hearing the songbirds singing their spring songs. Before you know it the red-winged blackbirds, Canada geese, and robins will show up. The snow we have piled up will being to melt and the hyacinth will struggle through the cold earth, fragrant flowers opening to the warm sun to fill the air with sweet scent. Ahhh. 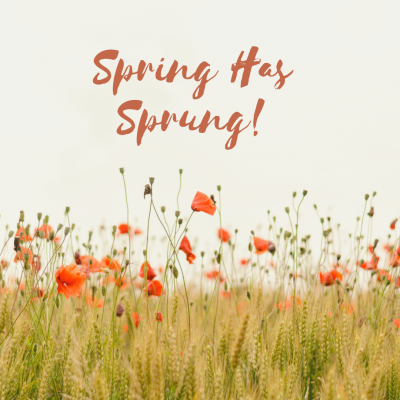 Yes, spring is here and I am ready to embrace it with open arms! I love everything about Spring! The snow leaving, all the birds returning. Although we did have a Robin last week, in our apple tree , who I am sure was totally confused by the mountains of snow in our yard. May she come quickly , but not too quickly as I don’t want my basement to flood.